Choose from 2 Properties - also see VR 7008744 Now in our 27th year! Key Colony Beach, known as the 'Gem of the Florida Keys,' is located 110 miles south of Miami. KCB is part of Marathon, but our Island juts out into the Atlantic Ocean a mile, forming one of the most beautiful white, sandy beaches, in the entire Keys. Our 2 private 1/2 duplexes are 200 feet from the Atlantic Ocean. See VR 7008744. Rent both for up to 12 persons. Relax on vacation at your home away from home. Both properties come with membership to the Cabana Club. Unit 380 listed here is half of a full duplex that when rented together can sleep 6 per side. Just walk off our driveway diagonally and you are in the Cabana Club Pool and Beach parking lot. We are the closest full duplex to the Club. Sorry, No Pets allowed. Properties are non smoking. Smoking permitted outside only. Our ocean view full duplex sleeps 6 per side including kids. Rent both halves for family reunions or multi family vacations. We are the closest full rental duplex to the Cabana Club beach and pool located on the Atlantic Ocean. each property has a terrace that faces the Ocean. Walk to 3 restaurants, scuba dive, snorkel, tennis, golf, and much more. DO IT ALL OR JUST RELAX! Now Renting in our 27th year. When you book with us, you will be dealing directly with the owner. We have 26 years experience renting and our location is the closest to the Cabana club beach and pool. We have been with VRBO since it's inception and our low 3 digit VRBO 449 number shows how seasoned we are as owners. We will answer your requests for availability faster than anyone. At our ocean view side by side duplex, you simply walk off our driveway and cross a residential street( E Ocean) and you are in the parking lot of the Cabana Club. No one on the Island will be closer to the beach than you! Our full duplex ( See VacationRentals 7008744) is perfect for multi family vacations and can sleep up to 6 per side for a total of 12. Guests will be able to enjoy one of the only oceanviews available at a private home in Key Colony Beach. The ocean is only 200 feet from our properties. We are the closest side by side full duplex to the Cabana Club. Membership provided to The Cabana Club. Members only heated pool and white sandy beach on the Atlantic Ocean. 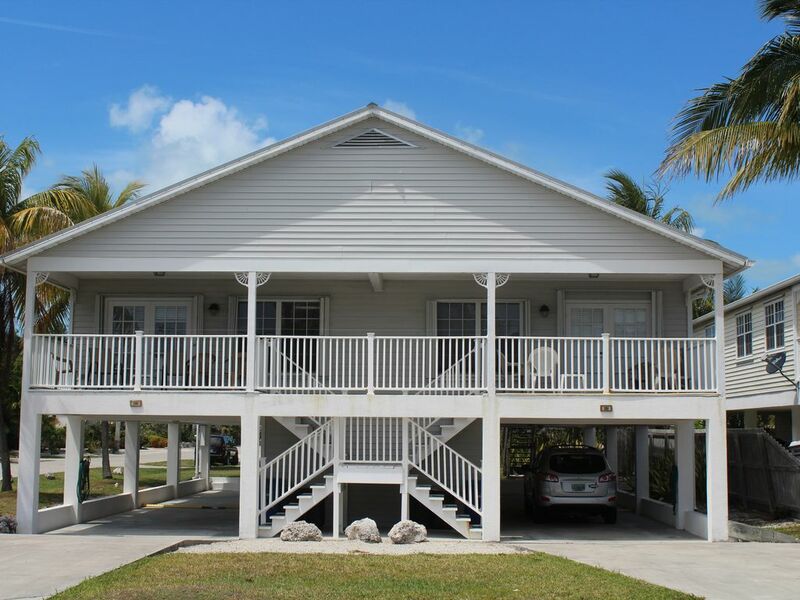 TV (with cable and satellite),Internet, Pool, Private Beach Club, Full Membership, Poolside Bar, 2 Units available for family reunions and multi family vacations, See our third property below. By renting all three properties you could have a family reunion of up to 16 people including kids. Deal directly with owner. Now in our 23rd year.